Folded color map in Spanish with postal code, time zone, and brief history chart. 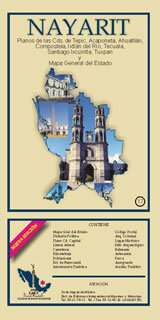 Includes main region map (scale 1:460,000), Tepic (1:15,000), Tuxpan (1:14,748), Ahuacatlan (1:9,319), and Tecuala (1:12,440). Also includes insets of Ixtlan del Rio, Santiago Ixcuintla, Compostela, and Acaponeta.